Ever since one of the best shows of all time, Parks and Recreation, introduced Galentine's Day in 2009, it's been one of the best holidays of the year every year. I personally have celebrated Galentine's Day with great enthusiasm in the last 6 years. This year, CollegeFashionista has compiled a list of the best ways to celebrate Galentine's Day, and is hosting a $500 giveaway for the winner to celebrate Galentine's Day in the best way they can. Read the post and enter the giveaway to have the best Galentine's Day ever! 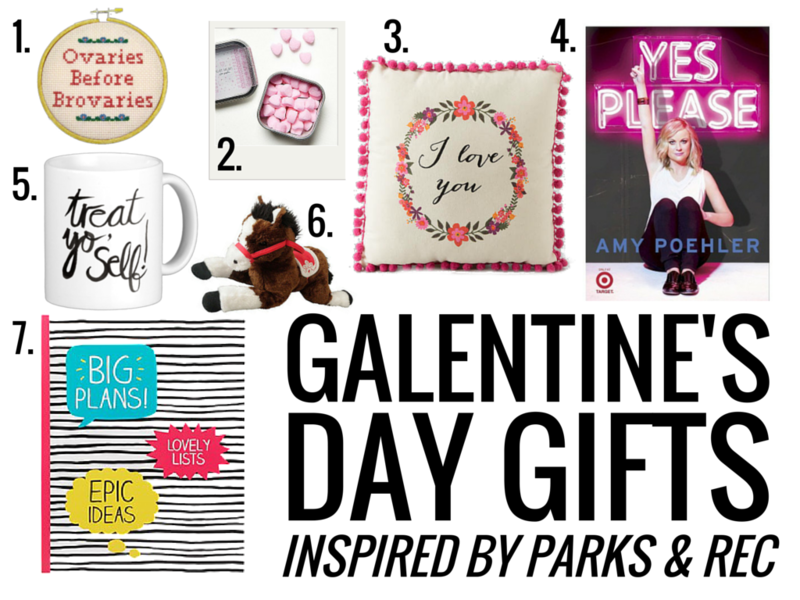 To contribute to this awesome Galentine's Day excitement, I've come up with a list of some great Parks and Recreation inspired gifts to give your Galentine(s) this weekend. Check them out below! 1. A hand-stitched Leslie Knope quote? Totally something Leslie herself would gift. 2. Sugar is a Leslie Knope classic favorite, and these heart-shaped tea sugars are perfect for your sweetest friend. 3. Hand-stitched pillows were a Leslie gift at the first Galentine's Day, so this "I love you" pillow is perfect for your Galentine. 4. Duh, Amy Poehler's book is a perfect Galentine's Day gift. Filled with girl power and Parks and Recreation behind-the-scenes stories, it's really a must-read for anyone who can, like, read. 5. Treat yo' friends to a "treat yo' self" mug. Sure, it's really more of a Donna than a Leslie thing, but everyone needs to know they deserve to treat themselves. 6. Lil Sebastian may no longer be with us, but this stuffed animal miniature horse is a great gift. 7. Can't you just see Leslie with this enthusiastic notebook?